You guys have to think realistic here. If the N9 has 12mp camera, you know how much the phone will cost? I bet the OS itself is expensive as well as the hardware. It'll make the phone thicker too. There's never a phone will ALL high-end features that's packed in a small device. As for the size of the N9, battery life may be short due to the design and processing speed. 5MP Camera is good as long it can get 720p vid recording with good quality. The 4inch screen resolution of 460x800 is actually pretty good. One thing that I don't really like about the N9 design is "tilt-slide". It just doesn't look reliable. Instead of TFT Screen, they should use Amoled with gorilla glass. HDMI output may be useful for other people, but to most people in general, it's not even going to be of any use. I think nokia should try Android.. Nokia has good hardware, they just need a good OS to boost the experience..
Xtc, 13 Oct 2010Some specs might be change,since this phone is still rumor. 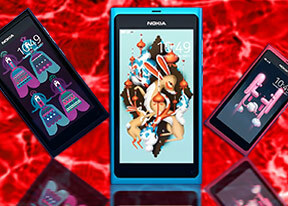 Lets hope nokia make something bet... moreI'm wondering how Nokia is planning to position the N9. With a new OS, I wonder how complete it is going to be. The new WP7 from MS appears to be somewhat incomplete and all indications that it will be improved in future versions. It makes me wonder how complete Meego will be when it debuts with the N9. I think that something will have to be sacrificed either with the N9 hardware or the Meego OS in order for the N9 to come out in a timely manner. Nokia may have to release something with fewer features, but have it working well in a timely manner. It's better than releasing something that is buggy or much later. Between the hardware and Meego, there is no phone on the market or upcoming that I want more. i have not enough money to buy this. Some specs might be change,since this phone is still rumor. Lets hope nokia make something better than this. I waiting all almost 4 years to replase my Nokia 95 8GB with good specification and ONLI WITH QWERTY BUTTONS PHONE! Look! Why you add many features on Nokia N8 when phone only with touch sensitive screen!? AND ON NOKIA N9 ALMOS ALLL THIS NEWS FEATURES MISSING? How long need to wait until u realise QWERTY phone with all last modern features?????????????????????? Yes, i can bue Samsung, but don't like Android OS, coz Google Co. Also on a Samsung QWERTY phones missing some important features like front Camera and some other. On Motorola also no front camera! Now i waiting and hope on Sony-Ericsson, maybe they realise new QWERTY phone with all modern features and not be too pricy? why just document viewer but not editor? why nokia procucing they handset always not best features. why not make one, bust with all last features handset??????????????? great specs but only disapointing part is the cam, only 5mp? They should make it 12 or 8mp. BTW, this phone (this is still a phone?) will run MeeGo OS for sure if this device is not a hoax because N8 is the last symbian for Nseries. is this phone true or it is only concept?? Awesome specs but will Nokia support/push the OS this time? I am constantly amazed at what I can do with my N900 but development for Maemo is pretty much dead. Don't let another great phone go unnoticed Nokia. Xtc, 09 Oct 2010And price atleast $1000 or more. :-)Yea dat is tru. The better d specs d more expensive d phone will be. If u r lookin at d price den d n9 is not d phone 4 u. Nokia hasnt released a phone vit good specs recentli. At d moment 4 me d phone wit d best specs is d samsung galaxy and d samsung wave 2. But i must admit d camera in d n8 is amazin. So at least hopefulli d n9 will be d best.